“Le Conchiglie” Residence is located in the old part of the island of Marettimo, named “LO SCALO VECCHIO”. Its location is unique, just in front of the sea, you can enjoy the marvellous view: the Castle of “Punta Troia”, “Lo scoglio del Cammello” and the wonderful islands of Favignana and Levanzo. The Island of Marettimo offers the visitor all kinds of services such as bank, post office, first aid station, internet point, bars, restaurants, pizzerias, little supermarkets, all easily reachable on foot. Car traffic is forbidden on the island. No. 6 Apartments: all independent furniture simple, functional and comfortable. Two-room-apartment B on the ground floor: Sea view, living room with kitchenette and sofa bed, double bedroom and bathroom with shower. You reach the room through some stairs. Two-room-apartment D on the first floor at the back side: Living room with kitchenette and sofa bed, bathroom with shower, bedroom with double bed and extra bed. 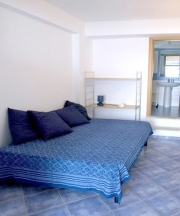 Two-room-apartment F on the first floor: Sea view, living room with kitchenette and sofa bed, double bedroom and bathroom with shower. You reach the room through some stairs. 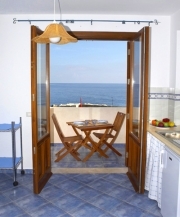 Marettimo is located 21 kilometres away from the port of Trapani which can be reached by hydrofoil or ferry. We recommend leaving your car in the parking Egadi about 2 km from the port. The two points are connected by shuttle. E 'possibile raggiungere Marettimo plane, train or car to Trapani. From Trapani connections, which is by hydrofoil ferry.